When you suffer from significant blood loss due to surgery or trauma, you will most likely go through a blood transfusion procedure to save your life. During the process, you will receive blood cells from a donor into your bloodstream. This will prevent you from becoming anemic and save you from possible death. Though it is rare that you will need a blood transfusion during surgery, sometimes you may need specific blood products. It is important to speak with your doctor and surgeon about the risks associated with the procedure and why it is necessary in your case. Before you undergo a blood transfusion procedure, your blood will be tested to determine your blood type. There are four blood types – A, B, AB and O. They will also determine if you are Rh negative or Rh positive. All these tests are done so they can find an appropriate donor. If the blood you receive is not compatible with you, your body will reject it. Blood can contain one, none or both of A and B antigens on the red blood cell surfaces. The blood types are determined by this makeup. When only the A antigen is present on the surface and the plasma contains the B antibody, you have blood type A. When you have the opposite, B antigen on surface of cells and A in plasma, then you are blood type B. If you have both on surface and none in the plasma, you are blood type AB. Finally, if you have neither A or B on the surface of your red blood cells but have both in your plasma, you are blood type O. The other antigen to consider is the Rh factor. When it is present, you are Rh positive. When it is absent, you are considered Rh negative. So if you are blood type A with Rh positive, you would be referred to as blood type A positive. A blood transfusion procedure can be a lengthy process depending on how much blood you require and what type of blood product. The typical time for the procedure can be anywhere between one to four or five hours and is usually performed in an outpatient clinic, hospital and sometimes even a doctor’s office. You will have to lie down or remain seated during the transfusion. Before the procedure begins, a blood type test will be done again to verify you are scheduled to receive the right type. Once this is confirmed, an IV line will be implanted into a blood vessel. The blood for the transfusion will be introduced to your body through the IV. During the entire transfusion, a nurse will watch over you to make sure everything goes smoothly. When the transfusion is complete, your IV will be removed. Do not be alarmed if you develop a bruise at the IV site. It should go away after a few days. When Is Blood Transfusion Needed? 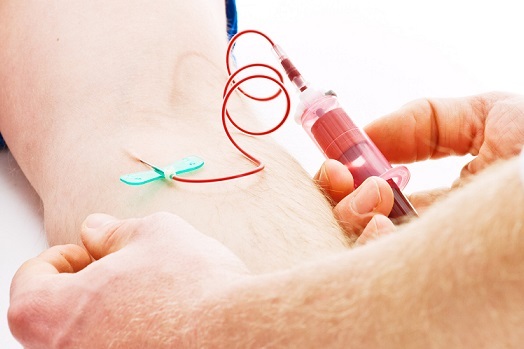 There are a multitude of reasons why you may need a blood transfusion procedure. There are so many components to blood and each one is needed for a variety of things. There are white cells, red cells, platelets and plasma. When you get a transfusion, you can get whole blood or only the components you need. Whole blood transfusions are rare as today’s technology is so advanced it can separate blood parts. While there is no substitute for human blood at this time, researchers are still working towards creating an artificial blood substance. When you lose a lot of blood, you can become anemic. This can happen during an injury or a surgical procedure. There are also certain health conditions which can cause anemia. Whatever the reason, you will receive a transfusion made of primarily red blood cells. When you experience blood loss due to a bleeding ulcer or engorged veins, it is vital to receive a blood transfusion. Bleeding in the digestive tract can lead to serious health complications and even death. When you are being treated for cancer, several of the chemotherapy and radiation drugs can affect your blood cell count. Cancer itself can impair your ability to produce blood cells and its products. You may receive a blood transfusion procedure to keep your blood levels at a healthy count. There are several other types of illness that can affect your blood cell count and clotting ability. Blood transfusion procedures can be used to counter the effects of these ailments. Plasma, the liquid element of blood, is often transfused in the case of liver failure, infection or severe burns. If you suffer a blood disorder, you may get a blood transfusion of platelets, clotting factors or red blood cells. A blood protein called albumin is often transfused if someone suffers from liver problems. Will There Be Any Risks Associated with Blood Transfusion? As with any medical procedure, a blood transfusion comes with its own set of risks. Although rare nowadays, there is still a slight chance of infection. More commonly are complications due to non-infectious factors or adverse reactions to the procedure. These reactions can be experienced immediately or can take numerous days to develop.